Editors’ note: This article was published in the Nonprofit Quarterly’s spring 2016 edition, “Strategic Nonprofit Management: Frameworks and Scaffolding,” and was first posted online on April 25, 2016. It was excerpted from a research paper looking at the constraints and foci of social media practice in twenty-six small environmental organizations. We thought that the discussion of the kinds of conversations the nonprofits had with the various stakeholders on multiple social media platforms was thoughtful and informative with respect to how the new communications environment is evolving. The paper was originally published by ACM in May 2015. It has been abridged and adapted with permission. We ask a question, and when they respond, we can become close to them through being actively engaged with what they’re saying. You have to build up to a point where people feel almost safe, and that it’s going to be all right if they’re wrong. Many of the nonprofits found that hashtags on Twitter were particularly helpful for initiating such discussion, as the hashtag format “speaks in ways a sentence can’t.” Nevertheless, many also said that despite using these strategies in their social media, their followers were still not actively participating in the conversations. There were very few people who could take time off during the day to sit and listen to this court hearing, even though everybody was extremely interested in the outcome of this debate and what the judge was going to say. So I was able to live-tweet that court hearing. The Twitter stream that I was posting got a gigantic spike of followers, and people were really tuning in. The bigger question becomes, are they going to sign the letter to Congress or are they going to sign the letter to the Wisconsin legislature when there’s an issue going on that they can take action on? Or are they more of just a casual supporter? And that’s something we’re trying to get a handle on. We invited people to participate on social media. They loved the pictures and the quotes that people were sending in about the river. But we didn’t get a single person to print out the form and put a check with it and send it to us from any of the platforms we used electronically. More recently, we did ask people to call their local congressmen about the Water Resources Development Act. I was sort of surprised [by] the e-mails I got. People were forwarding to me the responses they got from the congressmen when they did call. I think people like some of the news stories that we post, and if we post something fun like, “We just got a million-dollar grant from the EPA,” a lot of people tend to like those things. Sort of a “Yay. Congratulations.” The Like button’s like a virtual high five. Facebook is crazy. They measure every little click that anybody does. But it’s hard for me to capture that information and present it to our board members to explain whether the performance of our social media is improving or needs boosting. For this post, the people that like the thing—twenty people out of the three hundred and twenty-nine likers we have here—I don’t know who they are. They don’t show up on e-mail lists. I know that they’re mostly local, which is good, because that means that they saw us somewhere, or picked up one of our bookmarks somewhere, and liked the page. But we need to figure out how to connect these people to our organization. They’re disconnected from other parts of communication that you have. We have observed that small nonprofits seek to achieve a complex assemblage of public engagement goals with different stakeholders. However, distributed coordination with multiple sites and a diverse and fluid workforce; time, funding, and expertise constraints; and organizational policy all factored into decisions about which social media to use and how social media sites were used by these small nonprofits for public engagement. In the small environmental nonprofits, there was usually a shortage of labor for social media management. Participants noted that they commonly “wear a lot of hats” and were responsible for a variety of communication and public relations tasks. Social media management work, though important, was only one small component on the long list of such tasks. As a result, most of the nonprofits did not have one person wholly dedicated to social media management but instead distributed the responsibility across a group of staff members. This “all-hands-on-deck” approach to social media management followed several different patterns. The first mode was that each staff member would manage one official social media page with which he or she was familiar. The challenge, as a result, was to coordinate among different social media pages. We don’t have a process of running something by the whole team, because that’s too slow. We just have to trust each other’s judgment, and each of us does it. If there’s something that I do have a question about, it’s easy for me to run it by somebody if I want, but it’s not required. So it does allow you to peek behind the curtain of our organization, kind of humanize people. But not in a frivolous way, and then I think that builds the interest that we naturally have. We’re just naturally curious about other people. As a smaller organization, a Twitter account and a Facebook page are pretty much all we can handle at this moment. I think as far as social media go, we have to devote our time to quality over quantity when it comes to that. Facebook also has its sharing algorithm, which is very different than it used to be a few years ago. And I think that it limits how many of your supporters see your post. Their promotion scheme, where they’re trying to charge for increased visibility of your post, I think is absolutely killing the platform for nonprofits. I just really think that Facebook should have an exemption for 501(c)(3)-recognized nonprofits, that our pages shouldn’t have to be subjected to promotion functions. We should be able to have our supporters see all of our posts at all times for free. The one thing that we never ever do for any reason, ever, upon penalty of me being very angry, is you never, ever, ever post on Facebook what’s on Twitter. Facebook and Twitter are not synonymous. The platforms don’t work together, so stop trying to make them work together. The nonprofits we studied had their own organizational policies or guidelines that regulated their social media use regarding the approval of content, ownership of social media sites, and interaction with social media followers. However, these organizational norms and routines did not always work collaboratively with their social media practice and public engagement goals. Twitter goes to our Ohio account. Facebook, we’re not able to do that. We have a blog, but we don’t have any control over that. We just submit things to it once in a while. Flickr, we can’t have one of those. So those are national; I don’t think we’re allowed to. We don’t have very much available to us. Instagram is another one. Our main director doesn’t like hashtags for some reason. I think they’re a great tool to use when you’re using Twitter. Now, on my personal account, I use them a lot. When it comes to responding to different posts from other organizations, it’s kind of hard to go through that approval process. We’ll like on Facebook or favorite something that somebody says on Twitter, but we won’t necessarily respond in words. Our findings provide a background for understanding the challenges for small organizations in using social media to engage with diverse stakeholders and enact different public engagement goals. Small organizations need to better understand and evaluate the success of their social media performance, especially given the lack of awareness and information regarding their social media audiences and whether social media can foster long-term, productive relationships with those audiences. Small organizations also face several inter organizational challenges that sometimes hinder their engagement goals. These all call for significant design and research trajectories to support complex social media use for public engagement in small organizations. However, to be effective for small organizations, using multiple social media sites requires expertise, time, a relatively stable workforce, and proper collaboration among organizational staff. Most small organizations are constrained in their capacities to be able to manage and fully maximize the power of multiple social media platforms. Our findings indicate that social media platforms and tools to manage or make creative use of those platforms (such as Hootsuite, Sprout, and Storify) should better support heterogeneous content strategies, audiences, and stakeholders of organizational social media sites. Social media management systems should be designed not only to provide tools to manage multiple sites but also to provide guidance on how to use the unique affordances of each site to engage with different stakeholders. Visualization tools should provide straightforward and integrated summaries of individual and overall performance of different social media platforms. In addition, there is a need for tools to track interactions with different stakeholders, such as the number of retweets, @s, and conversations with other organizations, reporters, and donors. Another challenge for small organizations is the lack of accurate feedback regarding their social media performance. Though social media analytical tools that aim to measure social media success exist, these tools primarily target business sectors that measure the return on investment (ROI) of technology use such as sales and brand value. Most of these tools are also not free, which limits small organizations’ ability to use them. These findings have many implications for the design of social media analytical assessment tools for public engagement. There is, in particular, an absence of metrics that assess social media’s connection to important outcomes such as fundraising and volunteer recruitment. In addition to measuring the ROI of social media sites, it is also critical to support connections between social media performance and public participation performance. There is a need to connect social media analytical tools with more situated traces and records of which social media followers are really engaged and motivated to action—possibly through organizational information systems and metadata of volunteers’ and donors’ information (such as linking to online volunteer recruitment-management tools such as VolunteerMatch.org and fundraising sites such as giveforward.com) as well as existing volunteer or donor e-mail lists. These tools should also help aggregate detailed demographic and background information of participants to help small organizations better target and filter highly motivated audiences and mobilize them from “likers” to engaged actors. In our study, we also highlighted several organizational factors that influenced social media use in small organizations’ public engagement practice. It is crucial for computer–human interaction (CHI) researchers to acknowledge these constraints when designing social media tools for small organizations. It is also important pragmatic information for small organizations that want to facilitate their social media sites’ engagement with diverse communities. We found that multiple people were typically involved in the nonprofits’ social media management—either through dividing work among staff members or sharing responsibilities with multiple staff, specialists, and volunteers. This strategy poses potential problems related to coordination and quality control; it can also blur the boundaries between personal and organizational accounts.6 In addition, existing social media sites are usually designed for one account per organization or person who manages the public account. As a result, there is a need for social media management tools that support multiple users and multiple accounts, and provide the necessary links or distance between official and unofficial organizational social media accounts. In order to support efficient social media management within small nonprofits, the design of organizational social media platforms should also effectively incorporate the organizational internal workflow with different social media sites, such as drafting, editing, approving, and scheduling posts. In addition, organizational norms and routines, such as unwieldy, slow, and/or hierarchical approval processes, also prevented small organizations from being creative in content strategies, being interactive in communication strategies, and, in some cases, even adopting useful social media channels. In general, participants expressed a desire for greater flexibility and autonomy regarding social media site decisions and strategies. The influence of organizational norms and culture reflected the influence of power-oriented structures on the use of technology in the adaptive structuration theory,7 and was found in social media use in other organizational contexts.8 This suggests that small organizations should identify and resolve tensions between different constituents and coordinate to find the best strategies for using social media for public-engagement goals. Our findings also indicate that the design of organizational social media management tools should provide proper editing or management rights to certain aspects of work and organizational staff—for example, which type of work should be approved by which group of people—in order to mitigate conflicts between organizational power and efficiency of social media management. All quotes are from interviews with participants in the study unless otherwise noted. Chao Guo and Gregory D. Saxton, “Tweeting Social Change: How Social Media Are Changing Nonprofit Advocacy,” Nonprofit and Voluntary Sector Quarterly 43, no. 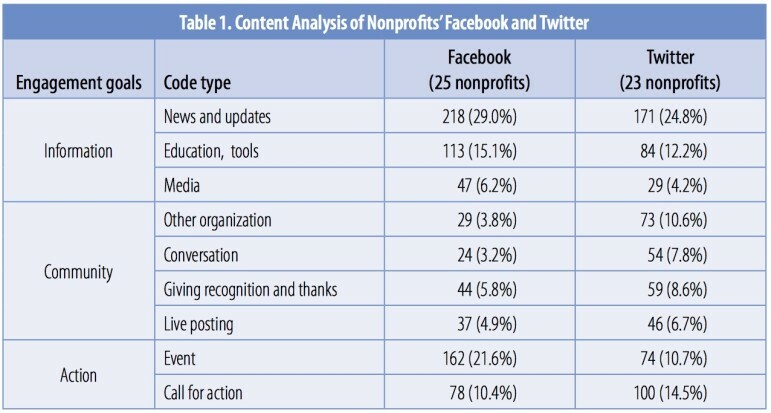 1 (February 2014): 57–79; Kristen Lovejoy and Gregory D. Saxton, “Information, Community, and Action: How Nonprofit Organizations Use Social Media,” Journal of Computer-Mediated Communication 17, no. 3 (April 2012): 337–53; and Richard D. Waters and Jia Y. Jamal, “Tweet, tweet, tweet: a content analysis of nonprofit organizations’ Twitter updates,” Public Relations Review 37, no. 3 (September 2011): 321–24. Jonathan A. Obar, Paul Zube, and Clifford Lampe, “Advocacy 2.0: An Analysis of How Advocacy Groups in the United States Perceive and Use Social Media as Tools for Facilitating Civic Engagement and Collective Action,” Journal of Information Policy 2 (2012): 1–15. Erich J. Sommerfeldt, Michael L. Kent, and Maureen Taylor, “Activist practitioner perspectives of website public relations: why aren’t activist websites fulfilling the dialogic promise?” Public Relations Review 38, no. 2 (June 2012): 303–12. Henrik Serup Christensen, “Political activities on the Internet: slacktivism or political participation by other means?” First Monday 16, no. 2 (February 2011). Meredith M. Skeels and Jonathan Grudin, “When social networks cross boundaries: a case study of workplace use of facebook and linkedin,” in Proceedings of the ACM 2009 international conference on Supporting group work (New York: ACM Press, 2009): 95–104. Gerardine DeSanctis and Marshall Scott Poole, “Capturing the Complexity in Advanced Technology Use: Adaptive Structuration Theory,” Organization Science 5, no. 2 (May 1994): 121–47. Derek Foster et al., “‘Watts in it for me?’: design implications for implementing effective energy interventions in organisations,” in Proceedings of the SIGCHI Conference on Human Factors in Computing Systems (New York: ACM Press, 2012): 2357–66; Christopher A. Le Dantec and W. Keith Edwards, “The view from the trenches: organization, power, and technology at two nonprofit homeless outreach centers,” in Proceedings of the 2008 ACM conference on Computer supported cooperative work (New York: ACM Press, 2008): 589–98. Youyang Hou is a PhD candidate at the University of Michigan School of Information. Cliff Lampe is an associate professor at the University of Michigan School of Information.